I’m an instructor, right? But the gun I’ve been carrying everyday isn’t one of the big three: Glock, SIG, or Springfield. It’s a Taurus! A sweet shooting, accurate, easy to carry Taurus, reliable enough when I feed it the right ammo. I like the Taurus. Since it was a concealed carry firearm, so there was no real opportunity for eyebrows to raise or for the small nods that seem to say, “Well, if that’s all you can afford, it’s a good gun.” The fact is nobody put any peer pressure on me. I put it on myself. I don’t care for Glocks. 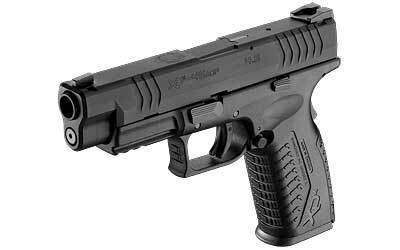 I’ve got a SIG, but it’s a 9mm, but I’ve wanted a Springfield XDm they first came out. I didn’t get a 9mm, passed on the 40, but when it came out in .45 I begain drooling over the ads again. All the time, I’ve watched students in our CHL and NRA classes blow the center out of their targets with an XD time and again. A little insurance money came my way from my Dad’s passing and yes, there were a lot of projects that have been put off for a while, but I took a little of the money and bought a Springfield XDm 45. First time I took it to the range, I was actually instructing a Basic Pistol student. At the end of the lesson I asked if she minded if I put up a new target and fired a few rounds from my new pistol. “No problem,” she said. I fired 20 rounds of Winchester Silver Tip Hollow Point. The center of the target disappeared and there were no shots outside the center ring. Impressive. When I tore it down to clean it later, I was impressed with how strongly the XDm is made. The return spring is so strong it’s almost more than I can compress by hand when putting it back together. Teardown was simple, cleaning straight forward.